Elemis fans, gather round – I have a great gift-with-purchase to tell you about occurring during May and it’s worth upto £89, yes really! Buy any 2 full-size Elemis products and choose FOUR complimentary travel-sized Elemis fan-favourites from a selection of EIGHT. Elemis travel-sized products are generally pretty generous on the sizing and I’m peering at that picture above to see what’s on the list! You also get the grey cotton cosmetic bag to go with it. If you’re not sure which products you should choose from the eight on offer, the therapists on counter have been briefed to offer some tailored guidance over which would suit your skin type. If it were me? I’d totes hit up the best bang for my buck ‘cos I’m mercenary like that and plump for the pro-collagen range. 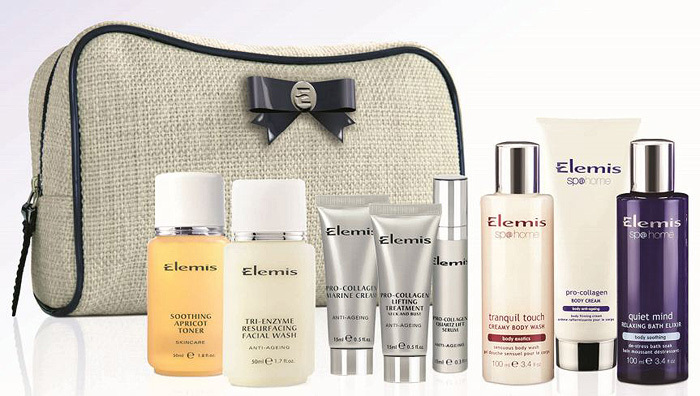 To find your nearest participating Elemis counter, click here. Which four products would you choose? That gift bag is beautiful! Doesn’t really go with the style of the Elemis products at all though. Nice to see a brand put some thought into it’s GWP.